Chalk Talk: Will Trubisky break records? Wondering about a player, a past game or another issue involving the Bears? Senior writer Larry Mayer answers a variety of questions from fans on ChicagoBears.com. Is Mitchell Trubisky on pace to break Bears single-season passing records? Mitchell Trubisky is on pace to eclipse Erik Kramer’s single-season Bears passing records he set in 1995 with 3,838 yards and 29 touchdowns. With 2,304 yards and 19 TDs through nine games, Trubisky is on pace to finish the season with 4,096 yards and 34 touchdowns. Trubisky is not on pace to break Jay Cutler’s marks of 561 attempts and 370 completions he set in 2014, but that’s understandable because the Bears played very poor defense and trailed a lot in 2014, forcing the offense to pass more than usual. The Vikings defense scares me in that I think they will blitz more against the Bears than normal. I think that it’s possibly the only way for them to beat the Bears. What can the Bears do to beat their blitz? The Vikings like to blitz, especially when they face young quarterbacks, and they do an excellent job of disguising when they’re coming. Said Bears offensive coordinator Mark Helfrich: “They’re really good at making the non-pressure and the pressure both look the same, and that’s how they get on the edge of people all the time is just that half a second, that half step where a tackle slow sets and then he’s beat off the edge or they’re worried about the A-gap and the B-gap pressure comes.” The Vikings also are able to generate consistent pressure from their front four; defensive end Danielle Hunter ranks second in the NFL with 11.5 sacks. In terms of what the Bears can do to beat Minnesota’s blitz, getting the ball out of quarterback Mitchell Trubisky’s hands quickly is key. Trubisky will have to read the blitz and throw accurately to a hot receiver. A screen pass like the one that Tarik Cohen turned into a 70-yard touchdown against the Jets a few weeks ago also would be nice to see. What is the Bears record when receiving the opening kickoff versus their defense starting the game? The Bears are 3-0 when they receive the opening kickoff and 3-3 when their defense starts the game on the field. In all nine Bears games this season, the team that has won the coin flip has deferred until the second half, so that also means that the Bears are 3-0 when they lose the coin flip and 3-3 when they win it. In games they’ve started on offense, their first possession has resulted in two touchdowns and one punt. In the six contests they’ve opened on defense, their opponents’ first drive has resulted in two TDs and four punts. In the six games the Bears have deferred they’ve opened the second half with two touchdowns, one field goal and three punts. 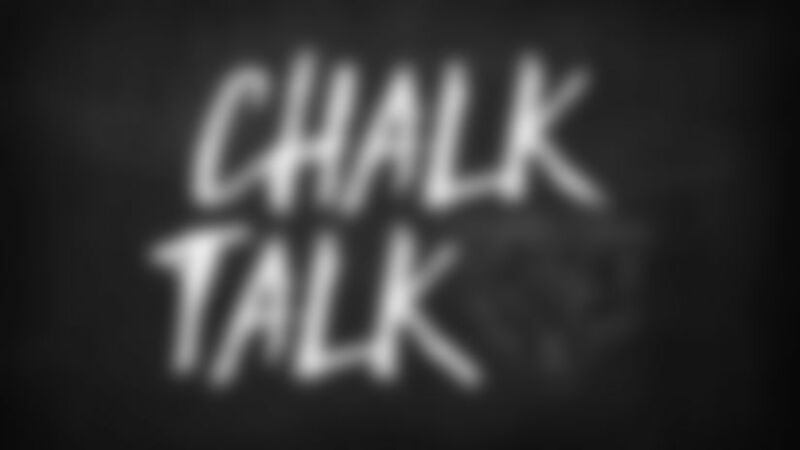 Chalk Talk: Who has been drafted at No. 87? Senior writer Larry Mayer discusses the last 10 players who have been selected with the 87th pick in the draft the Bears own this year, the last time the Bears traded a player in exchange for a first-round pick and Adam Shaheen’s status. Chalk Talk: What’s toughest part of schedule? Senior writer Larry Mayer discusses the most difficult portion of the Bears’ schedule, if the Bears could have a sixth night game added and the last time the Bears played on Thanksgiving in back-to-back seasons. Senior writer Larry Mayer discusses how many worst-to-first teams have repeated as division champions, how the Bears will create pressure situations in their kicking competition and Bears coaches who’ve been named NFL coach of the year in their first seasons. Chalk Talk: Where do Bears rank in strength of schedule? Senior writer Larry Mayer discusses where the Bears rank in strength of schedule, the likelihood of receiver Anthony Miller challenging for a starting job in 2019 and where the Bears might trade up in the draft. Chalk Talk: What is plan at running back? Senior writer Larry Mayer discusses the Bears’ plans at running back, the transition at defensive coordinator from Vic Fangio to Chuck Pagano and the best players to wear No. 21 in Bears history. Chalk Talk: Have new Bears received numbers? Senior writer Larry Mayer discusses whether the Bears have assigned uniform numbers to the free agents they’ve signed, if Cody Whitehair and James Daniels could switch positions on the offensive line and why the Bears inked Ha Ha Clinton-Dix to a one-year contract. Chalk Talk: What is Zach Miller’s status? Senior writer Larry Mayer discusses tight end Zach Miller’s status and why the Bears signed kick returner Marvin Hall shortly after inking star kick returner Cordarrelle Patterson. Chalk Talk: Who are best kickers in draft? Senior writer Larry Mayer discusses the top-rated kickers in the draft, if a new rule should be adopted ensuring that both teams get at least one possession in overtime and if the Bears have ever selected a player with the No. 87 pick in the draft. Chalk Talk: What’s expected from Patterson? Senior writer Larry Mayer discusses the impact he thinks that Cordarrelle Patterson will make with the Bears, if the Bears should draft a kicker and how many Bears free agents have signed with other teams. Chalk Talk: What is deepest position in free agency? Senior writer Larry Mayer discusses the deepest position in free agency, veteran kickers who are available and running backs selected in the middle of the draft who’ve been voted to the Pro Bowl. Chalk Talk: Which top kickers were drafted? Senior writer Larry Mayer discusses how many of the NFL’s top kickers were selected in the draft, which NFC North rival will pose the greatest challenge to the Bears in 2019 and where Mitchell Trubisky ranked in passer rating. Chalk Talk: How many kickers have Bears drafted? Senior writer Larry Mayer discusses kickers the Bears have drafted, if the Bears are looking for different characteristics in draft prospects to fit Chuck Pagano’s defense and top tight ends in the draft. © Chicago Bears. All rights reserved.